Based on the book written and illustrated by James Hance, this Winnie the Pooh/Star Wars mashup is the perfect way to start the morning. I hesitated suggesting this at first because the legal work to get this made would have to be a nightmare. But then I figured…why not? This isn’t about reality. This show would be a hoot to watch. Last summer my daughter and I read through all of the Bone comics. This is a tale that practically begs to be brought to life in animation form. I’m surprised it hasn’t happened yet. There’s talk of movies, but I think a 65-episode series is where this thing needs to go. “andrewkful” on YouTube has put together a little clip of what this thing could look like. It’s time for a non-comedic version of this character to return to our screens. In fact, it already did all too briefly in a pre-opening sequence on Batman: Brave and the Bold. I’ve spoken of my love for this character before. What more explanation do you want? The guys that made this clip need to make full episodes now! This is another one that I hesitate bringing up because I think the movie is perfect and needs no sequel. But sometimes these animated series are surprising because they aren’t constrained to the two hour format of telling a new, different and complete story. So seeing Wesley, Buttercup, and co. riding around the world interacting with new bad guys and fiends could actually be fun to watch in cartoon form. Aaron Bouthillier’s style looks great for this. 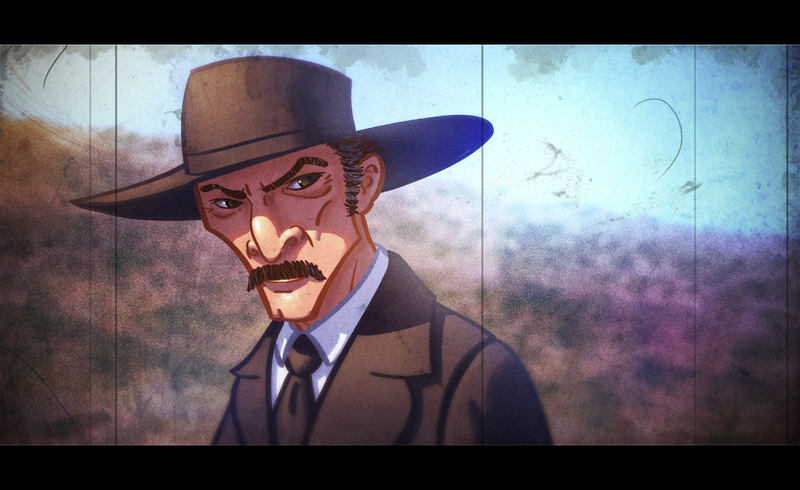 This one might be my most far-fetched idea because I’m not sure if westerns have ever worked in animation. 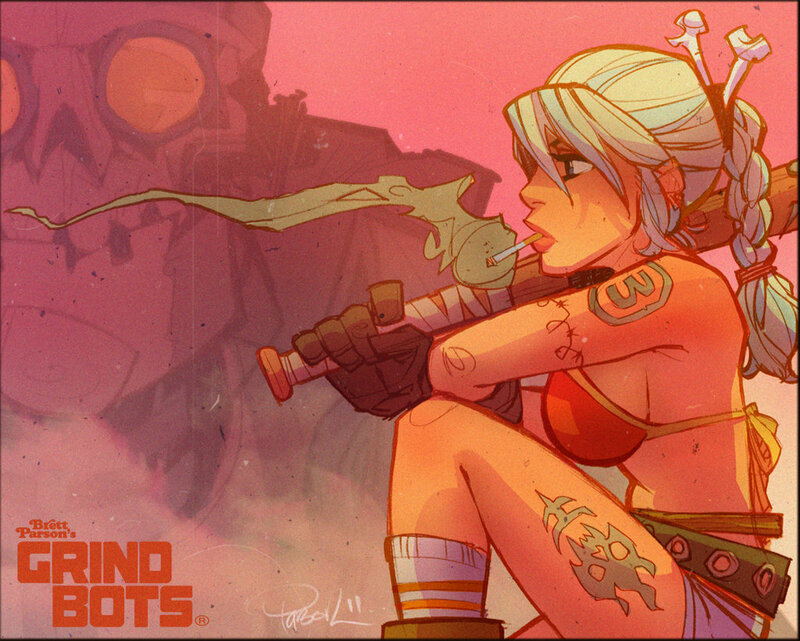 But when I saw this piece by Timothy Anderson, I thought it might be worth giving it a shot. There has been a Man With No Name comic series from Dynamite so maybe some story inspiration can be drawn from there. I’ve got to admit that I’m torn on this one. 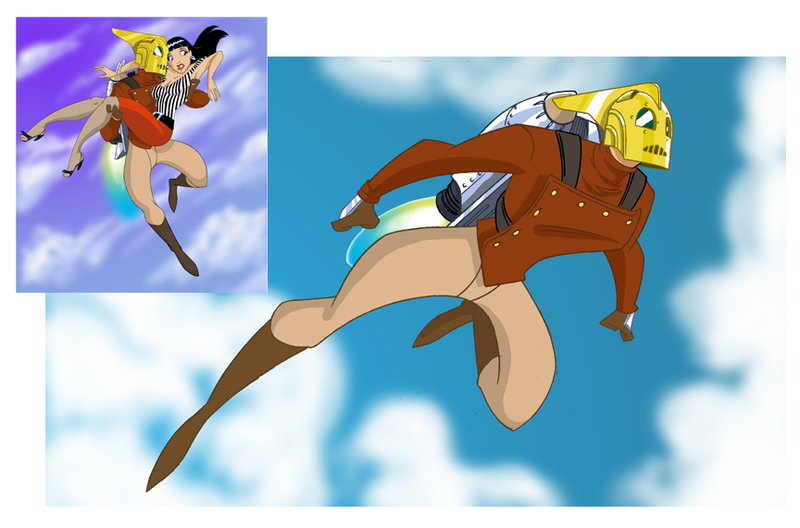 I want a Rocketeer cartoon for sure, but the style can be any number of things. Maybe the route to go on this is the same as what they are doing for the comic and just tell a bunch of different short stories in various styles. There are a few styles worth mentioning and any one of these could work for a whole series. First, artist Des Taylor has done some great commission work of The Rocketeer. Sign me up for some more of his stuff (more on him next). There’s another art style I came across years ago but I no longer have record of who the artist is. If anyone knows, please tell me. And finally, there was a short film made not too long ago done in a “Pixar” style (or so it was called) and while I don’t think it’s 100% there, I’d dig it for an anthology-type series. I’m hazy on what the deal is here. This is from artist Kris Anka, but what the overall story is, I don’t know. 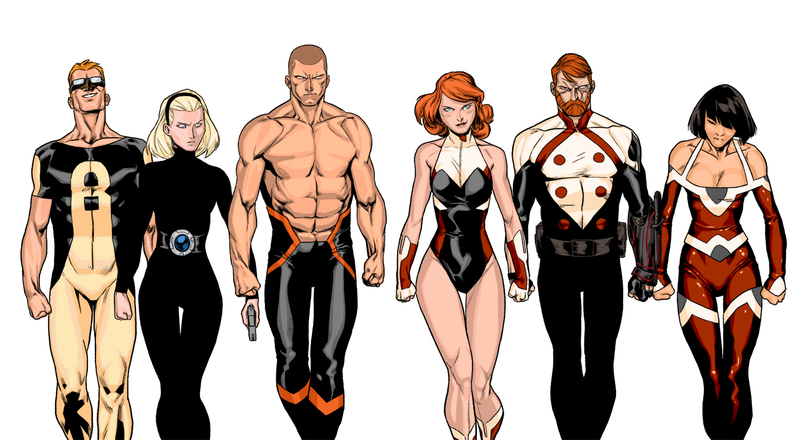 I really liked the Team Omega pieces, but they may be a part of a bigger story called The Forgotten. Either way, this stuff looks cool and it needs to get on my TV screen. 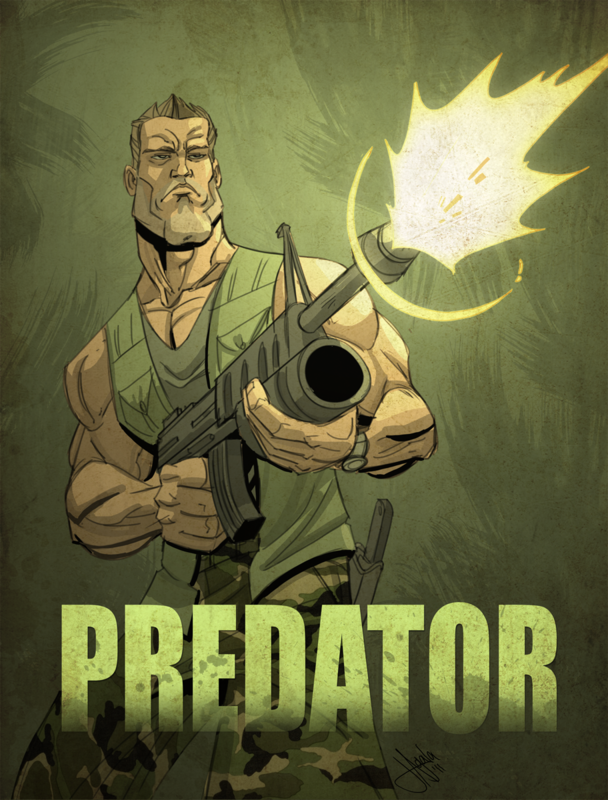 In the tradition of seeing Rated R movies become cartoons (something you can read more about with an article by Shawn Robare in the upcoming Strange Kids Comix Anthology #3), I sort of wondered why Predator never got a cartoon. In a sense, it might be a one-trick pony and not really merit more story if the sequels have shown us anything. But then again, the comics have been pretty successful, so why not? 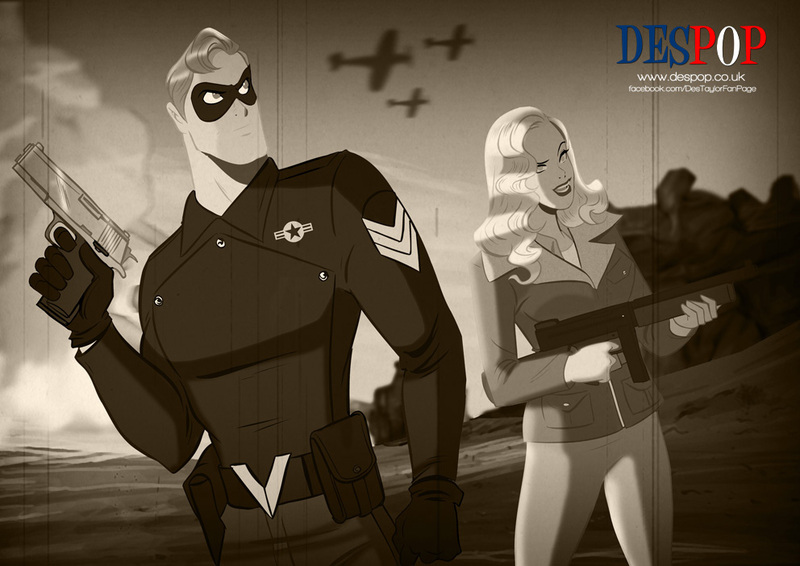 I really liked this piece by Jeff Agala and figure it would make the great basis for the animation style for the show. This is another one where I really have no idea what this story is about or if it would work in a cartoon format. In fact, based on the artwork on DeviantArt, I daresay this would need to be toned down quite a bit for the Saturday morning crowd. But I love the art style. What I’m seeing makes me want more. Brett Parson is welcome to work on expanding this into a 13 or 26 episode series as far as I’m concerned. One I didn’t mention but covered before is Thundarr the Barbarian. I’ve got my aforementioned reboot waiting in the queue for whenever one of the above show’s ratings slip and has to be pulled (yeah, I agree…probably the Man With No Name). Why are you not the program director for FOX saturday morning or the Cartoon network (Tele-Toon up here in Canada). Excellent ideas here! Jeff Smith spoke on a Bone cartoon proposal a while ago that was absolutely ridiculous. He had super vegetable growth powers or something in the proposal. Smith turned it down. If it gets made, it will be done right. Great, great line up, CT–very original. 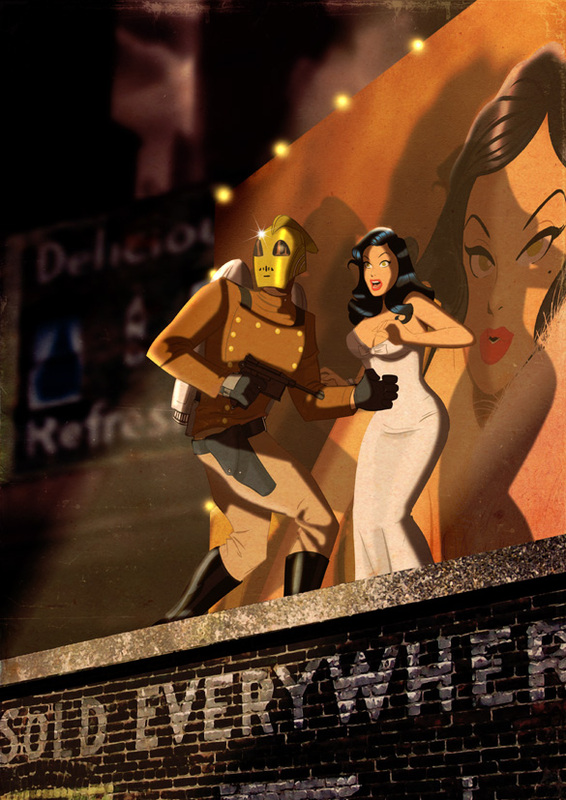 I love the Fleischer-style Rocketeer best. I would watch the beejesus out of a cartoon about the further adventures of Fessick and Inigo Montoya. I want that now. This was a fun one to put together. I had a few other ideas that didn't make the cut so I may have to do a weekday cartoons block of programming like this someday. I hope that when Bone happens, it is incredibly faithful to the source material. I'll be very disappointed if it isn't. I had never seen the Willow concept art. That could have been a pretty cool cartoon. Although I probably would not have watched it as that would have been about the time I wasn't watching as many cartoons because I had to go mow the lawn or something. 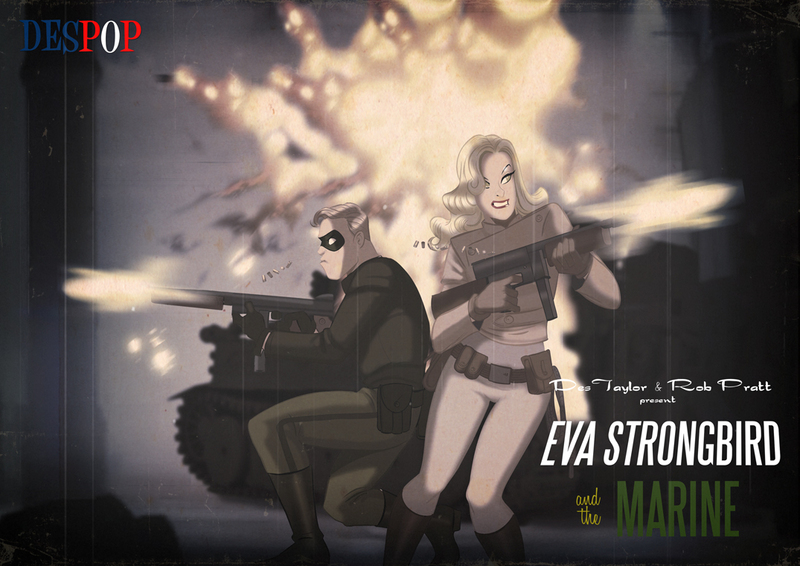 I think some movie properties benefit from an "expanded universe" cartoon. I don't care for Ghostbusters 2, but that cartoon was pretty good. 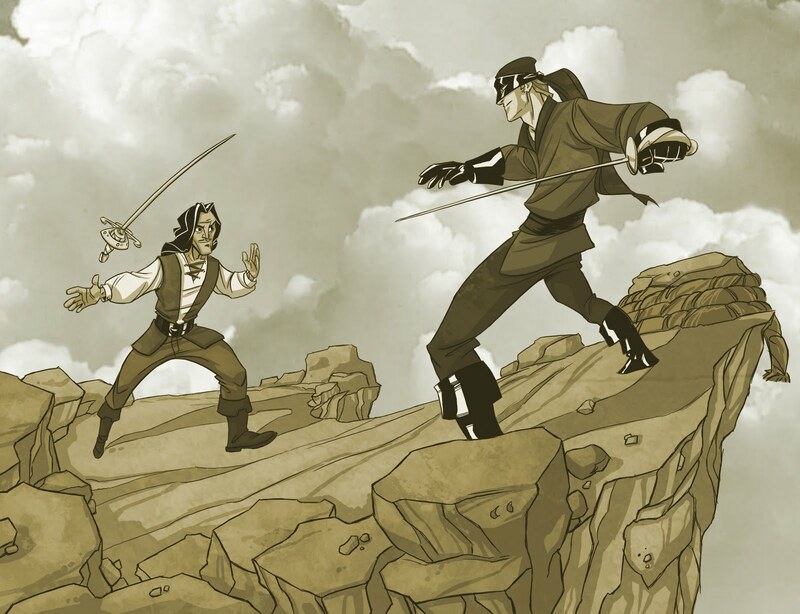 I never want to see Princess Bride 2 happen, but some "non-canonical" glorified fan fiction? Sure! Sign me up! Are you kidding?? This lineup looks awesome, even if it's not real, and I also love that you did something different from everyone else. I'd watch this! That Princess Bride mention reminded me of the failed Willow cartoon that never materialized. Ever hear about that one? How sweet would it have been to have cartoon versions of the 80's biggest fantasy movies? (Answer: totally freaking sweet.) With everything else silly that got made into a cartoon, it's a wonder these properties were never tapped.